CONVERGE is well equipped to simulate fuel injectors and sprays. Its convenient spray setup, wide array of fuel injection options, and robust and well-validated physical models allow for accurate and computationally efficient simulation of these complex physical processes. CONVERGE has two types of liquid injection parameters: nozzles and injectors. An injector is a group of nozzles. In CONVERGE you can set up local coordinate systems, which help you intuitively configure and manipulate the geometry of the nozzles within an injector. In applications such as internal combustion engines, the fuel spray initiates, propagates, and dissipates very quickly and on a very small spatial scale. To dynamically capture the important physics of the injection process, you need a high-density grid around the spray. However, you do not need high resolution far from the spray or before fuel is injected. Our automated Adaptive Mesh Refinement (AMR) technology provides the resolution you need exactly when and where you need it: in spray cases, near the injector and along the path of the spray. The combination of AMR and powerful spray models makes CONVERGE uniquely suited to helping you achieve grid convergent results in a timely manner. The combustion process can be strongly affected by the exact nature of the fuel spray: droplet velocity, size, distribution, and physical attributes. CONVERGE allows you to tailor the degree of accuracy of the fuel injection simulation to the needs of your particular study. You can analyze the injection of liquid fuel via physical models for blob injection, injection distribution, variable rate-shape, discharge coefficient, and hollow cone and solid cone sprays. You can generate an accurate prediction of fuel mass flow through the nozzle head with appropriate use of these models. 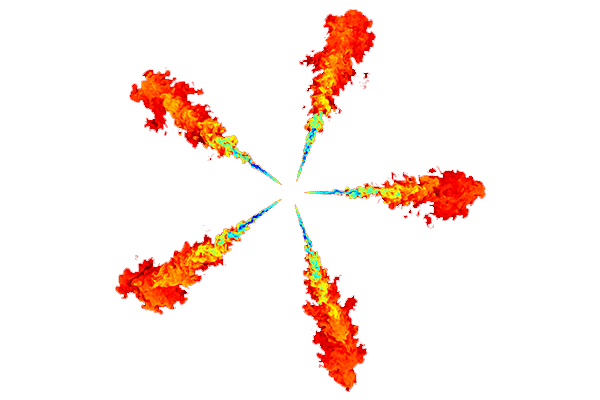 CONVERGE can also simulate the mixing and evaporation of multi-component fuel sprays. If you want to achieve a predictive simulation of complex physical phenomena, you need an array of physical models that are developed thoughtfully and implemented carefully. CONVERGE incorporates state-of-the-art options for spray processes including liquid atomization, drop breakup, collision and coalescence, turbulent dispersion, and drop evaporation. Consider drop-wall interaction. When a liquid fuel drop impinges on a wall, what should happen to it? The physical models implemented in CONVERGE provide for many possible interactions. A drop can rebound from the wall, slide, or form a liquid film; if you want, you can simply make it vanish. CONVERGE offers you the flexibility to get whatever level of accuracy you need. Real nozzles wobble during the fuel injection process. Using built-in prescribed motion routines, CONVERGE can easily handle this sort of motion, and the AMR automatically follows the motion of the nozzle and spray. Real nozzles cavitate, and so CONVERGE has implemented and validated models that capture the effect of cavitation in spray. CONVERGE’s volume of fluid (VOF) model allows you to simulate flow through an injector and to obtain detailed output. These VOF simulations can capture the spatial distribution of liquid flow through the nozzle, the effect of varying the injection pressure, the impact of needle wobble, and the transient effects of cavitation. Computational efficiency is important, and in CONVERGE you can run a VOF simulation of only the injector and then use those results to initialize the spray in an engine simulation. 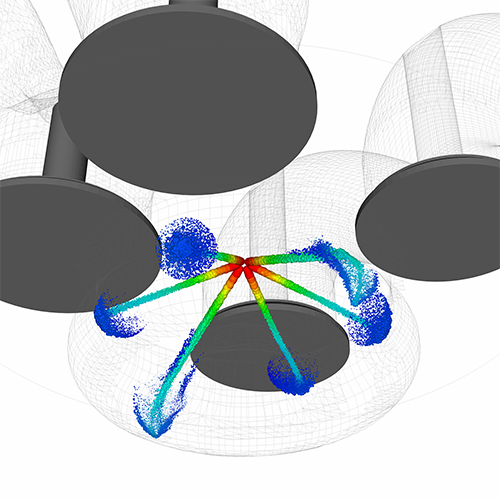 This VOF-spray coupling process allows you to incorporate into your simulations the spatial and temporal variation in injected fuel that is caused by cavitation and needle wobble. Through our collaborations with leading research institutions and through our own innovative efforts, we ensure that CONVERGE has data-driven models that will make your fuel injection and spray simulations repeatable and predictive. For example, we work closely with Argonne National Laboratory to perform injector simulations and to develop new spray models, and we are a member of Sandia National Laboratories’ Spray Combustion Consortium, which provides experimental data that we use to validate and improve our spray models. These and other partnerships help us bring CONVERGE closer to fully predictive CFD. Quan, S., Senecal, P.K., Pomraning, E., Xue, Q., Hu, B., Rajamohan, D., Deur, J.M., and Som, S., “A One-Way Coupled Volume of Fluid and Eulerian-Lagrangian Method for Simulating Sprays,” Proceedings of the ASME 2016 Internal Combustion Engine Division Fall Technical Conference, ICEF2016-9390, Greenville, SC, USA, October 9-12, 2016.